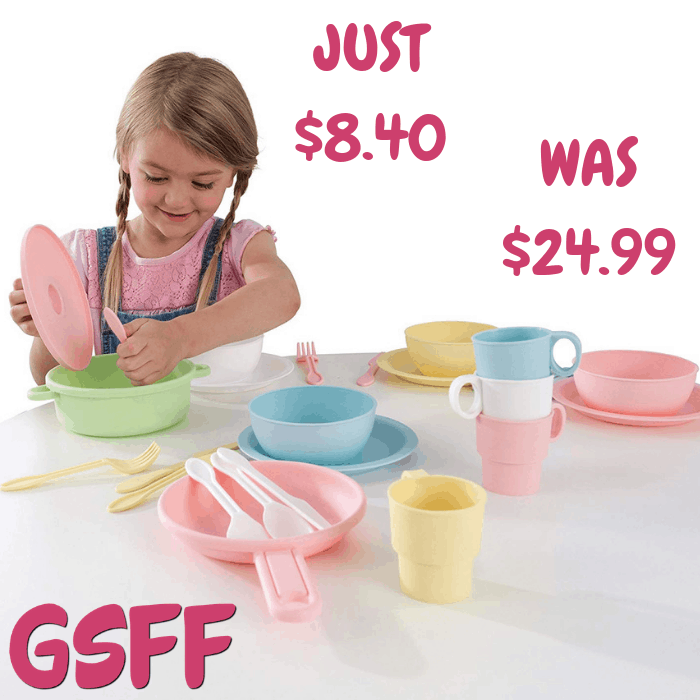 KidKraft 27-Piece Cookware Set Just $8.40! Down From $25! Shipped! You are here: Home / Great Deals / Amazon Deals / KidKraft 27-Piece Cookware Set Just $8.40! Down From $25! Shipped! Hurry over to Amazon where you can score this KidKraft 27-Piece Cookware Set for just $8.40 down from $24.99 PLUS FREE shipping! This complete 27-Piece Cookware Set has everything little cooks need to serve their friends, family or stuffed animals. Including cups, bowls, plates and more, our set is bright, cheery and made from sturdy, easy-to-clean plastic. 27 total pieces – four knives, four spoons, four forks, four plates, four cups, four bowls, one pot, one pan, one lid. Goes great with any KidKraft kitchen!